Our company has quite a lofty goal: To replicate the experience of working with a personal trainer at a gym, but in an online environment, 100% from your mobile phone. In order to achieve this goal, a lot of specific needs have to be met on the part of our development team. Because working with a professional expert is an extremely personal experience. This is the case whether it be with a personal trainer, a pilates instructor, a school tutor, a music teacher, and so on. With personal training though, this is especially true. Any time that you attempt to move any service from an “in person” setting over to an online environment (mobile app), it’s relatively easy to lose that personalization if you’re not careful. We see this play out in our everyday lives……. Example: If someone responds “sure” or “okay” to a question you ask them face to face in person, you’re quickly able to decipher that persons body language, tone, & meaning. In a text message or an email though, there is not always the same level of context built around that message. Are they being sarcastic? Are they being serious? Is that a good or bad thing? That’s why people often misinterpret digital forms of communication (texts, emails, tweets, etc). We don’t always do this on purpose, but it happens everyday. With that being said, we knew that we didn’t want to run into this problem with our app. As our Prolific Fitness teams been going through the development & coding of the app, we found the massive void that we needed to fill. 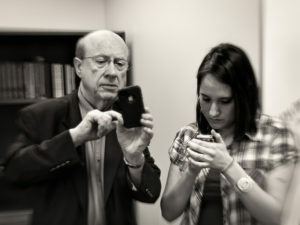 Having video sharing capabilities with your trainer. By adding this feature to the app, it allows users to share video clips of them in “real time” performing exercises. With this feature, we (the trainers) can then give them (app users) proper corrections on their exercise form, cue them better, & offer additional tips. One of the main luxuries of working with a trainer in a gym setting is that they are able to watch your form as you’re performing a new set of exercises. With us now being able to incorporate this new feature into our app, we’ll also be able to share that same level of personal connection with each client, but for a much lower cost. 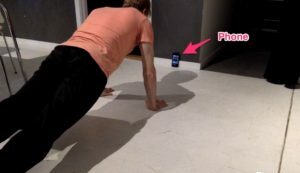 Below is an example of a user performing an exercise (below- push ups). This clip can then be sent to their trainer to analyze & to help make adjustments. Step 1) Press the Video Capture button in the app. Step 2) Set their camera down (facing them 🙂 would be hard to see them otherwise). Step 3) Hit Record & the timer will give the user several seconds to get set (Note: if you don’t like the clip you recorded, you can retake or delete a clip right away as needed). This feature adds a much deeper layer to the relationship between trainer & app user. As you can probably tell by this post………we’re really excited about it!!! If you’d like to experience this feature & the app for yourself before we launch it to the public, we’re offering exclusive “early access” to a limited number of users. All you have to do is click here & enter your e-mail. Know of somebody else (a friend, colleague, co-worker) who might be interested in the app?